It didn’t take much to entice four foodies to sit around a summer lunch table at one of South Africa’s top dining venues. A conversation about regional ingredients was the springboard. Chef and co-owner Bertus Basson put away his whites and took a seat at the appropriately named Hidden Valley wine farm in Stellenbosch. A faultless five-course menu with wines prepared by Basson’s Overture restaurant team proved a worthy diversion to debates about flavours and the triggers that make this chef tick. The man sporting a mohawk has an enquiring mind. His likes: classic recipes, slow braises, deep-frying, cookbooks and good-value meals. Dislikes: sous vide cooking and dishes that look pretty but are devoid of flavour. If he serves a ‘tongue in cheek’ braised ox tongue and pig cheek, it means the Overture kitchen is having fun. But it will be made from scratch with integrity. To avoid wastage, the offcuts will form the base for stocks, sauces, mousse or terrines. While his interest in regional ingredients tends towards the obsessive, Basson is no snob. He doesn’t impose a dress code on Overture diners because he wants them to feel comfortable while admiring the fabulous vineyard vista. He won’t turn his nose up at a hamburger in a family franchise when the mood takes him, but goes in search of inspiration and culinary sating at fancy Winelands establishments such as Jardine at Jordan or Rust en Vrede. Different situations bring joy at different times. “People should leave a restaurant feeling happy that they’ve had a great meal. It’s like going for a massage. I sit on George’s [Jardine] restaurant stoep and say ‘feed me’,” he grins. Let’s not ignore the meal. After five courses none of us felt weighed down, despite beef entrecote featuring in one of them. The table debated their favourites but the clear winner for this eater was fried chokka rings - East London calamari with slight chewiness enforcing its local status - on a delicate melange of salad leaves, mint and radish slices with Arborio “rice crispies” crunch. Freshly made tagliatelle ribbons with shitake and shimeji mushrooms perfectly browned in butter, fresh thyme and a dash of tangy Pecorino sauce - simplicity itself. And while you wouldn’t think it the season, a hot passion fruit soufflé worked a treat in a teacup, cooled with passion fruit ice-cream. Utterly delicious. 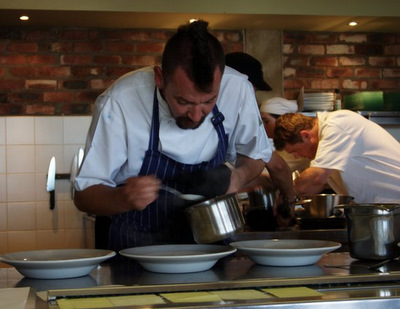 Basson oversees a small yet competent kitchen team at Overture, comfortably feeding 50. Co-owner chef Craig Cormack runs the catering arm, ensuring that each chef has the space to exercise his respective culinary style. Basson says the use of seasonal and extremely regional ingredients (farmers knock at his door with mussels, quails and unusual vegetables) keeps regular locals returning and prices competitive. The restaurant isn’t in the phonebook but has a waiting list in summer. Lunch or dinner options: any three courses (R255 excl or R310 incl wine pairings), four courses (R305 excl or R390 incl wine) or five courses (R365 excl or R470 incl wine), from a one-page menu. 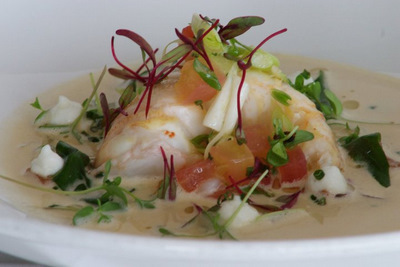 The tasting menu spans eight courses (R460 excl or R765 incl wine) of the chef’s choice. The wine features a small selection aside from Hidden Valley wines. Mark ups on the list are refreshingly within the 100% range. Overture is one of 19 restaurants offering food at Taste of Cape Town. The dish? An Overburger with truffle mayo, Parmesan fries and onion rings. OVERTURE, Hidden Valley wine farm, Stellenbosch. Tel 021 880 2721, overture Open for lunch Tues to Sun, dinner Thurs to Fri. Reservations essential.